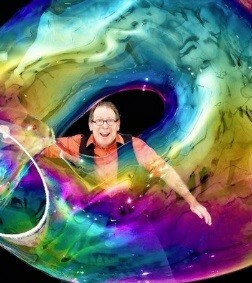 Louis Pearl has been thrilling audiences worldwide for over 30 years with the art, magic, science and fun of bubbles. An Edinburgh Fringe favourite, he has sold out there for the last twelve years. Louis explores the breath taking dynamics of bubbles, combining comedy and artistry with audience participation and enough spellbinding bubble tricks to keep everyone mesmerized. From square bubbles to rocket bubbles, tornado bubbles to flying saucer bubbles, the Amazing Bubble Man conjures shrieks of laughter and gasps of amazement from all ages. (Most shows include live music by Jet Black Pearl). The impressive Bacon Theatre completed in 1991 and built to a very high standard, boasts excellent sightlines and state-of-the-art facilities. The friendliest place to be entertained in Gloucestershire!